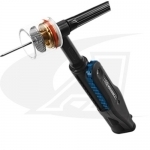 North / South rotary motion controls mount on popular TIG torch handles with Velcro Straps, and is also available with the switch Built Into the Handle for an integrated handle and switch design. 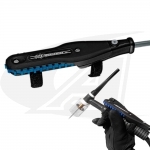 These lightweight yet durable, amperage controls feature a low-profile design for better comfort and increased productivity. Controls ship with replaceable cover plates and can be configured for right or left hand operation. Choose from 15' (4.5m), 28' (8.5m) and 53' (16.1m) control cables. Custom length control cables are available upon request.